UPDATED) Former president Ferdinand Marcos died in 1989 while in exile in Hawaii. How did his remains end up in his hometown of Batac in Ilocos Norte? MANILA, Philippines (UPDATED) – President Rodrigo Duterte allowed the transfer of the remains of the late dictator Ferdinand Marcos from his home province of Ilocos Norte to the Libingan ng mga Bayani (Heroes’ Cemetery), drawing both criticism and support from Filipinos. People who oppose the burial of Marcos cite his 21-year rule as Philippine president, marred by human rights abuses, corruption, and oppression of dissent. Victims of Martial Law also filed a petition asking the Supreme Court to stop the planned hero’s interment while more than a thousand people gathered at the Luneta to express their opposition to Duterte’s plan. Two rounds of oral arguments were heard by the High Court. On the first day of oral arguments on August 31, SC justices gave significant attention to human rights, the law creating the national pantheon (RA 289), the rules governing the Libingan ng mga Bayani, and Marcos’ record as a soldier. On September 7, the oral arguments focused on whether or not public funds should be used to fulfill Duterte’s campaign promise and the totality of laws that should be applied in deciding for or against the burial, among others. After the second round of oral arguments, the SC ordered both sides to submit their memoranda within 20 days. The justices also extended the status quo ante order to November 8. People who are for Marcos’ transfer to the Heroes’ Cemetery say it is “time to move on.” It’s been 27 years since his death but the debate continues. But how did Marcos’ “well-preserved body” end up in Batac, Ilocos Norte if he died while in exile in Hawaii? Here’s how it happened. After 3 years in exile with his family and allies, the former president died on September 28, 1989 in Hawaii at the age of 72. 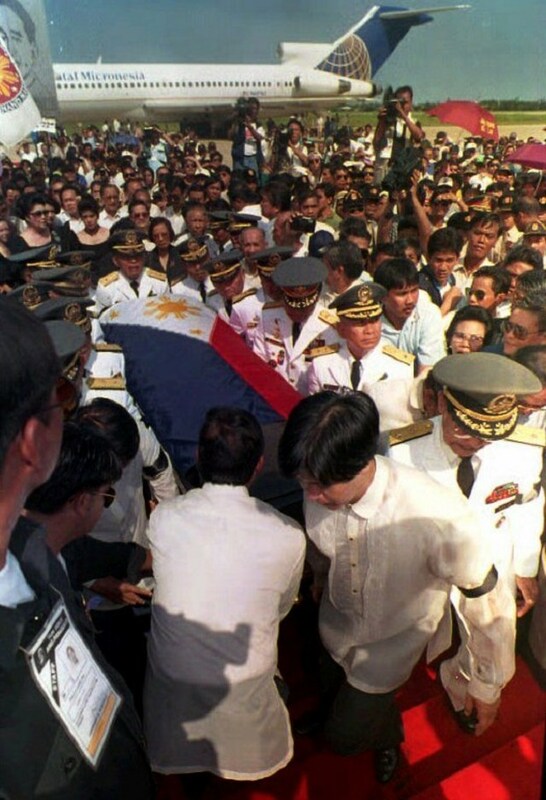 Then president Corazon Aquino, who became president following the People Power Revolution in 1986, did not allow Marcos’ body to be flown back to the Philippines for burial. The US Federal Aviation Administration, meanwhile, issued an order preventing the operation of any aircraft carrying Marcos’ body from the United States to the Philippines, then US State Department spokesperson Richard Boucher was quoted as saying in a 1989 Los Angeles Times report. During the last months of the former dictator’s life, the Marcos family filed a petition to overturn the ban by the administration. The Supreme Court, however, dismissed the petition, stating that Aquino “did not act arbitrarily or with grave abuse of discretion” with her decision. The High Court decision was released on September 15, 1989 or less than 15 days before Marcos died. 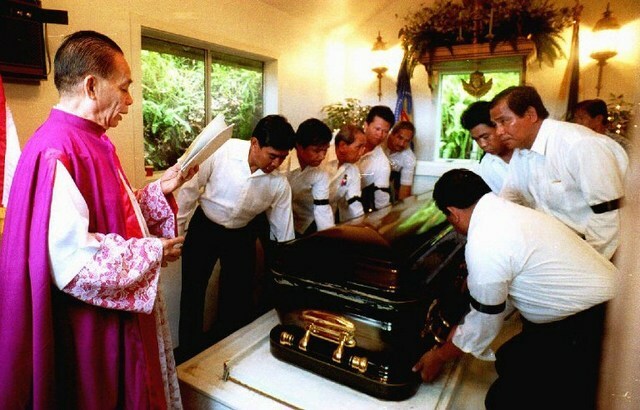 Due to the government ban, Marcos’ body was interred in a private mausoleum at the Valley of the Temples Memorial Park which overlooked the Byodo-In temple in Hawaii. 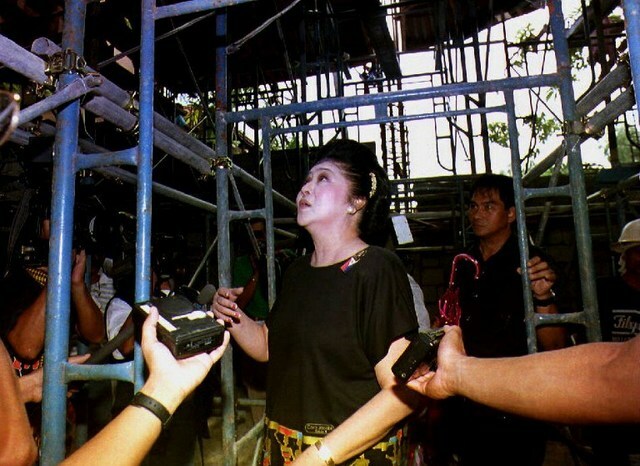 Imelda Marcos and her family returned from exile to the Philippines in 1991. The body of the family patriarch, who reportedly wished to be buried in his home country, was left in Hawaii. 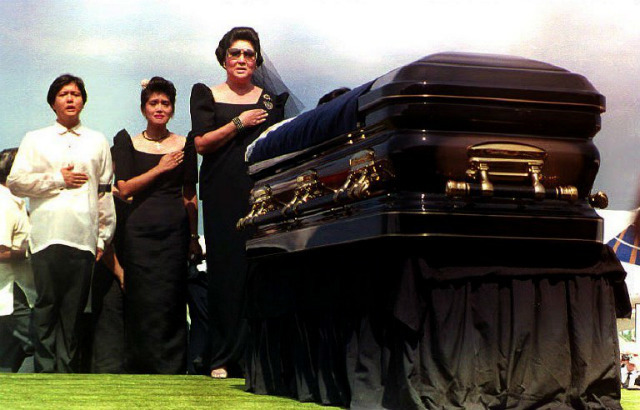 In 1992, the Aquino government again barred the return of Marcos’ remains until after the May elections, fearing that it could spark more election-related violence. Imelda was then running for president but placed only 5th out of 7 candidates. A year after in 1993, then president Fidel V. Ramos gave the go signal for Marcos’ remains to be flown back to the Philippines. He, however, refused to give full state honors to the former president who put the country under Martial Law. 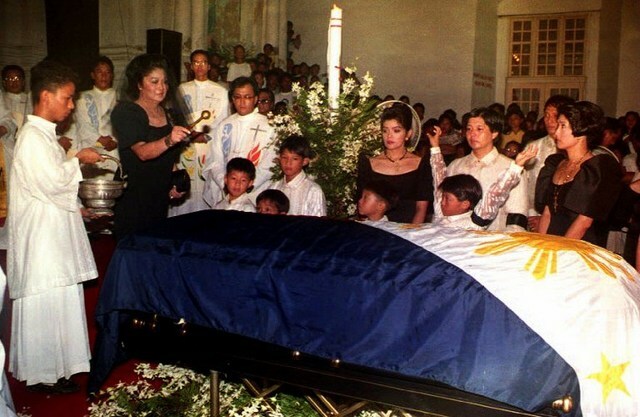 Marcos’ body was flown via a chartered Continental Airlines jet direct to his home province, Ilocos Norte. 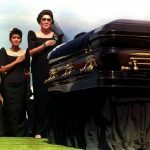 On September 7, 1993, 4 years since his death, Marcos’ body inside a “black-lacquered, gold-handled casket” finally returned to the country he ruled for more than two decades. The direct flight, according to former interior secretary Rafael Alunan III in 2016, was part of the deal signed by the Philippine government and the Marcos family. There was a lot of “singing, dancing, and various rituals,” according to news reports then, as his casket was placed on a platform for all to see. Aside from the ordinary Marcos supporters, government officials who served during his administration, along with other allies, were also present when his body arrived. The casket was then transported using a horse-drawn caisson to the Laoag Cathedral as huge crowds gathered along the roads leading to the church. Since the government then refused to allow him to be buried in the Heroes’ Cemetery, Marcos’ body was interred in a glass crypt in the Marcos Museum and Mausoleum in Batac City, Ilocos Norte. 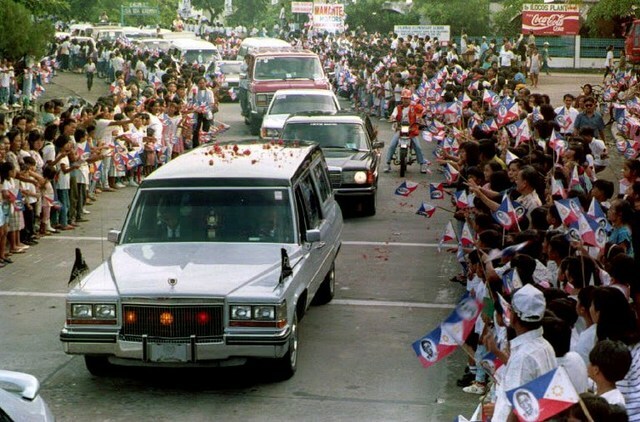 Through the years, tourists and loyalists alike have flocked to the museum to view the body of Marcos. 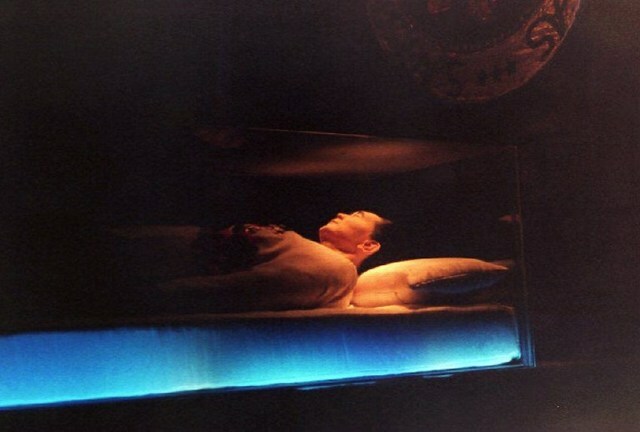 The placement of the late dictator’s embalmed body in a transparent crypt, according to his family, is temporary and only until the government finally decides to allow his burial in the Heroes’ Cemetery.